Spectra: Spectroscopy indicating that PNV J17184504-2454221 is an Fe-II nova (highly reddened) was obtained by L. Chomiuk et al. (ATel #10959) on 2017 Nov 13.00 UT using the Goodman Spectrograph on the SOAR 4.1m telescope. Observing recommendations: Observations of all types (visual, CCD, DSLR, spectroscopy) and multiple bands as instrumentation permits are strongly encouraged as the nova evolves. Dr. Koji Mukai (NASA Goddard Space Flight Center) recommends that observers use B, V, and I filters if possible to enable studying any color changes. Because the object is heavily reddened, V and I would be better than B and R. He does not recommend R, as it contains H-alpha, which complicates interpretation. Dr. Mukai and colleagues have requested a target-of-opportunity observation with the NASA Fermi Gamma-ray Space Telescope, i.e., asking Fermi to modify its survey pattern to increase exposure time in the general direction of the nova. Optical observations are extremely important, so despite the nova's proximity to the Sun, observations are urgently requested. Dr. Mukai also suggests that observers able to carry out spectroscopy might find this object an interesting target. Charts: Charts with a comparison star sequence for PNV J17184504-2454221 may be created using the AAVSO Variable Star Plotter (VSP). 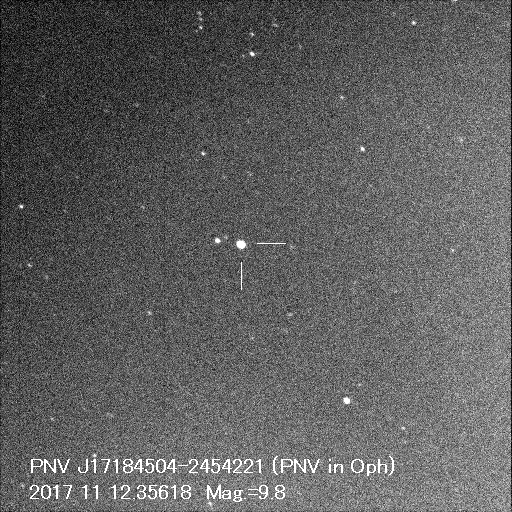 Submit observations: Please submit observations to the AAVSO International Database using the name PNV J17184504-2454221. Once a GCVS name is announced in an IAU Circular or CBET, please use that name. a. Designated PNV J17184504-2454221 when posted to the IAU Central Bureau for Astronomical Telegrams Transient Object Confirmation Page (TOCP). Unless otherwise noted and except for observations reported to the AAVSO, the information in this Alert Notice is taken from the TOCP page or ATel #10959.
b. S. Kaneko writes that nothing is visible at the nova's location on a frame taken on 2017 November 4 UT. c. Confirmed by T. Noguchi (Chiba-ken, Japan) on 2017 Nov. 12.356 UT at magnitude 9.8 (unfiltered CCD). d. T. Noguchi (Chiba-ken, Japan, 2017 Nov. 12.356 UT) reports position end figures 45.01s, 21.8". e. P. Schmeer (Saarbruecken-Bischmisheim, Germany) reports that three Gaia DR1 sources (all of 20 mag) are within 6" of the reported position of this transient. One of them (G= 20.3 mag; position end figures 45.07s, 23.3") is 1.7" from the discovery position. f. T. Noguchi (Chiba-ken, Japan, 2017 Nov. 12.356 UT) provides the following image: http://park8.wakwak.com/~ngc/images/PNV ... 171112.jpg. Congratulations to Shizuo Kaneko on his discovery! V1369 Cen is a great target like V339 Del has been for many observers around the world. I think your medium resolution spectra are very useful to astronomical community. Although it is the same type of nova Fe II nova it seems to me quite different from V339 Del. Its also different photometrically, at least at this early fireball stage. Where is Ken's spectra posted?